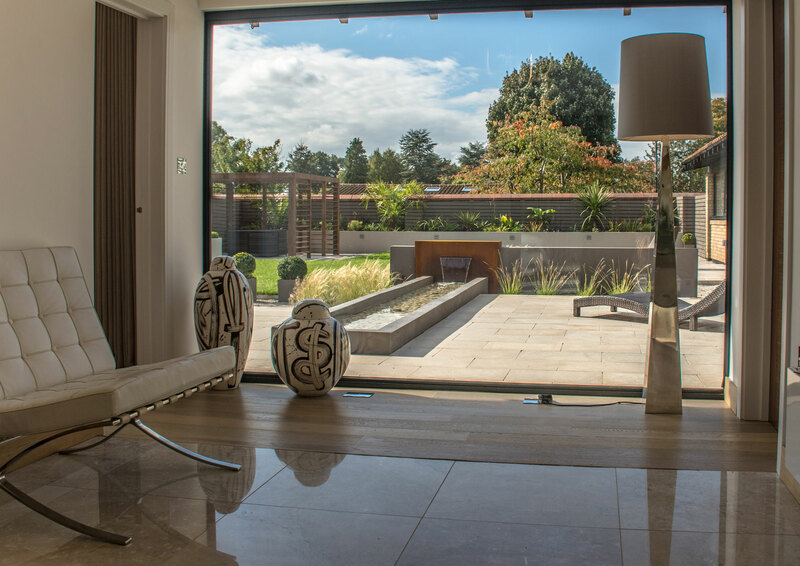 In the planning and designing of domestic outdoor spaces the garden designer may often find his or herself low down in the pecking order as the architecture and interior are prioritised naturally. I’m often told “we don’t know the budget for the garden yet, we’ll see what’s left after we’ve finished the house”! As a garden designer and a fan of architecture, in particular the use of glass in modernist buildings, it excites me to see large windows being installed, bringing the outside-in and ultimately giving your place as a garden designer much more precedence. The relationship between client, architect, interior and garden designer can sometimes be a challenge as we’ll all have our own ideas. First and foremost we have to please the client whilst staying true to the architecture and working with the interior to create a flowing and coherent space. Lets not forget adding your own touch as a designer too as the client has invested in you and your style. Continuity and cohesion are words I use a lot during consultations as the success of a space can weigh heavily on them. Clear communication and an understanding of the architect and interior designer’s intensions can only help you fulfil such philosophies. In any creative industry, borrowing and allowing our surroundings to influence our work is how we progress, it’s what drives new ideas. Approaching garden design whilst working with other professionals should be the same. Using elements of the architecture and interior in the garden may feel like cheating but it creates a bond and a relationship between the elements and ultimately leads to coherent design. Each project, client and collaboration brings a new experience and keeps us on our toes as new relationships are created and exciting spaces spring up out of the ground. A recent experience of working with an architect and the interior designer, who happen to be husband and wife and owners of the garden, saw a project take shape in an uncustomary fashion. Whilst given artistic license on the design which would sit next to a modern renovation, during the build their influence lead to changes which I may not have agreed with at the time. However a creative understanding and a willingness to work with and listen to each other lead to a successful relationship and ultimately a one space that flows from inside-out. Good design is often not the idea of one, but the collective thoughts and teamwork of everyone involved.